I have a school provided email (name@ins.edu) that is located on an outlook server (pod#####.outlook.com) that I configured in Thunderbird using the settings provided by the web-based outlook portal. I am connecting via IMAP and can retrieve all email messages and synchronize all folder except the Sent folder as it is tied to SMTP. Oddly, when I was configuring the email in Thunderbird it continued to fail when I specified the settings I got from outlook.com but succeeded in creating the account with incorrect IMAP settings that it detected by polling the server. It wasn't working after completing the set up so I changed the IMAP settings to what they should have been and now as I mentioned, I am able to retrieve mail. This has never been a problem before and I have used several Outlook/Thunderbird clients as well as android mail clients without many problems. I can send mail on my phone and in Outlook. 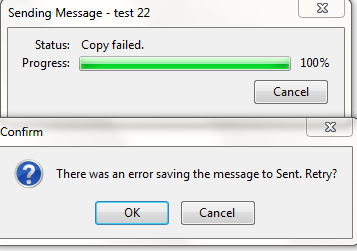 Update: I was able to send a test message a few times but it still could not copy the message to the Sent folder. I also seem to have 3 Sent folders (2 "Sent" and 1 "Sent Items"). I was able to view one Sent folder's contents so I thought that one worked but after setting the outgoing mail to copy the message to the supposedly working Sent folder, I am now no longer able to view the contents. Whats going on here? There was a great deal of "folder corruption" via duplicates and improperly set up folders that were being referenced incorrectly. Had to restart about 10 times and continually re-connect to the server while cleaning up the duplicates/wrong folders that were added via K9-Mail on my Android phone and perhaps Thunderbird as well. Moral: keep a clean and tidy folder set up for email. Not the answer you're looking for? Browse other questions tagged email thunderbird smtp or ask your own question. Secure email sending with Thunderbird? How does Thunderbird Send Email?